I like easy food. Not so easy that I’m going to go out and get fast food, but with young kids and a house to run, it’s hard to prepare 12-step fancy French recipes every night. So when I come up with something that cooks quickly, is easy to throw together, and doesn’t require any unusual ingredients, I like to share it, because I know there are bunches of people just like me out there. The latest, cider-braised turnips, isn’t a main dish, but would go well with a hunk of meat, like a roast you stick in the crock pot before you leave for work. Though we generally plow through our apple cider within a few days of getting it, one recent gallon started to go ‘hard’ almost as soon as we got it home (when it tastes like it’s getting fizzy, that’s your first sign that fermentation is taking place). Of course, if you want a little kick to your cider, don’t be afraid of drinking it! So we had a little left in the jug and I had some freshly pulled turnips waiting to be used. 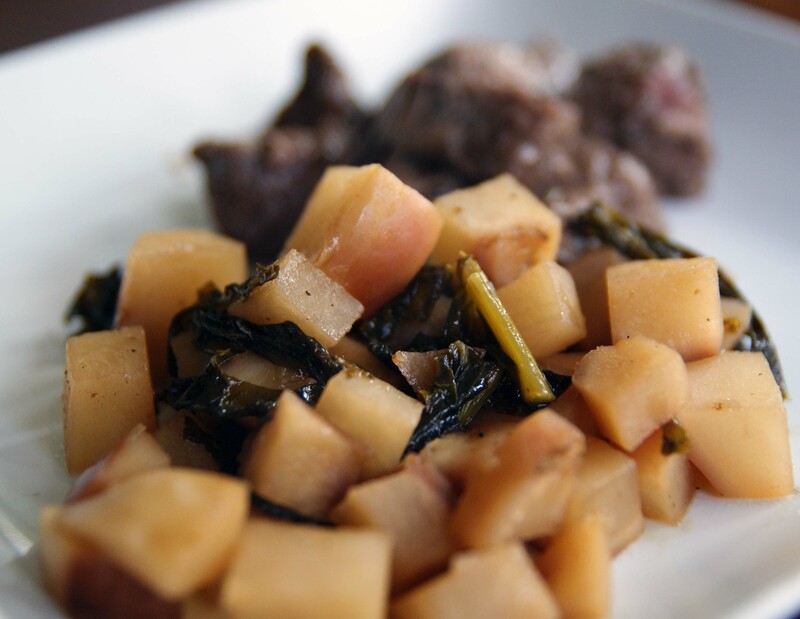 We diced up the turnips, tossed them in a pot with the cider, let it simmer for a bit, cooked up some beef while it was simmering, and we had ourselves a meal complete with cider-braised turnips. I even added the greens for an extra vitamin kick, but it’s not necessary. I really enjoy braising, and it’s probably something I should do more often – the flavor of the braising liquid imparts itself to whatever is being cooked, and it’s almost guaranteed to end up nice and moist. Put all the ingredients into a Dutch oven. The liquid should just cover the turnips - if there's not enough, add water. Bring to a simmer, then cover and let cook for 15-20 minutes. 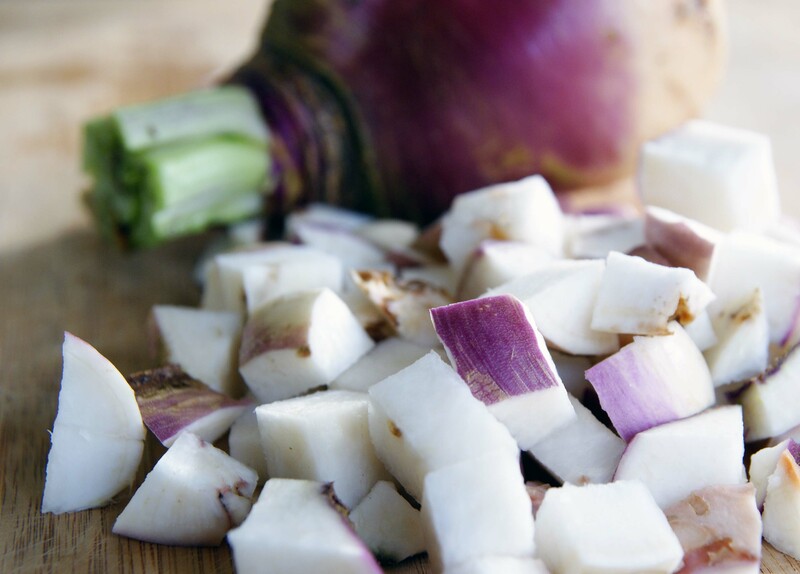 Check the turnips for doneness - they should be almost tender. If they're not, give them a few more minutes. Remove the lid to finish cooking (another 5-10 minutes). At this point, you want some liquid to evaporate so you end up with a syrupy glaze. Remove from heat, and serve with a side of beef or pork.